I’m currently on maternity leave, but my passion (my non-baking passion) is my work: user experience. In a nutshell, user experience (UX) is a realm of graphic design that aims to ensure that a product/service gives the most enjoyable and intuitive experience possible. Although a lot of the preliminary work may be based on intuition, experience and guesses, the only way of knowing if the premises laid out are true is to do testing. Lots of testing. Particularly useful is A/B testing, which involves creating two different experiences for the same, say, website and seeing how people’s reactions differ to the variable(s). Let me give an analogy, as I would to my 3-3/4 daughter. 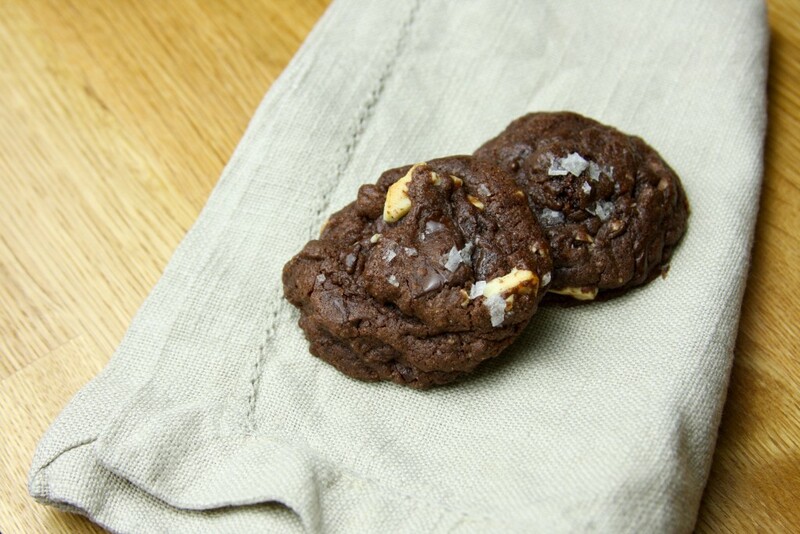 Say you had a batch of cookies, but wanted to test different types of chocolate. You could make the recipe with chocolate A, eat the results and jot down the notes; then make another batch with chocolate B, eat the results, jot down the notes and compare. But it means you have to remember a fairly ephemeral and intangible experience, you’re baking for more than an hour, and you’ve filled every cookie tin you own and/or had to buy a pair of bigger jeans. 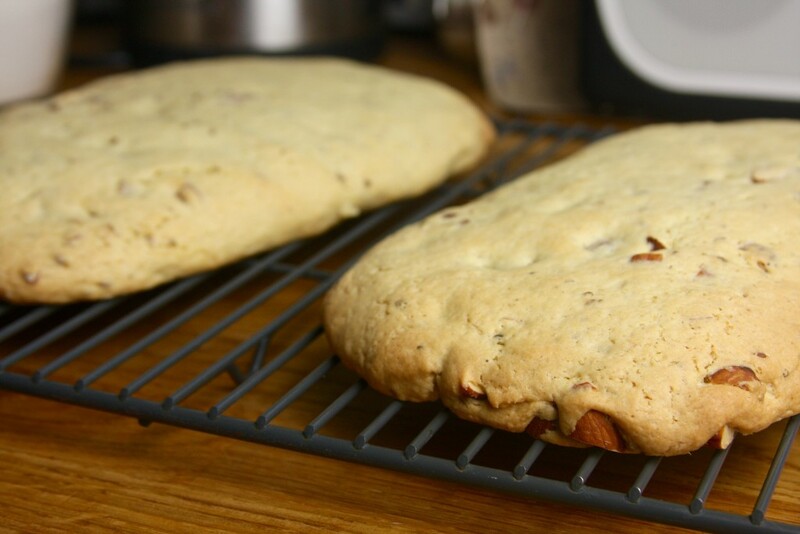 Much easier is to simply make a batch of cookies, split it in half (or as many times as types of chocolate being tested), and bake the variables at the same time. Then sit back, taste each option at the same time, mark your notes and declare the winner! Aurelia helped me with this, err, not-so-theoretical experiment. I still levy a ‘visiting’ tax upon every visitor from the US in the form of Nestlé semi-sweet chocolate chips; there’s nothing remotely like them in the UK, where plain (dark) chocolate is the baking standard. My poor, lovely mother-in-law packs additional suitcases to help diffuse the weight of these quintessentially American morsels when she visits. And so, to cut this cord with the US and be able to find and suggest suitable alternatives here in the UK, Aurelia and I set out to work on this A/B test. Tested were: chocolate A — Nestlé semi-sweet chocolate chips (47% cocoa); and chocolate B — Lindt Dark Cooking Chocolate 51% Cocoa. Chocolate B came in large bar form, so we had to chop it up as close to ‘morsel’ size as we could (I say ‘we’ generously, given the knife). I found Choc A to be waxy at start without much taste, then quite sweet, with an unexpected, but pleasant, final taste. I found Choc B to immediately melt and be uniformly warm and rich in flavour. Aurelia preferred: ‘both’. When incorporated in their respective portions of cookie dough, I couldn’t make out much of a difference in flavour. Aurelia liked: ‘both’. Hip hip hooray! 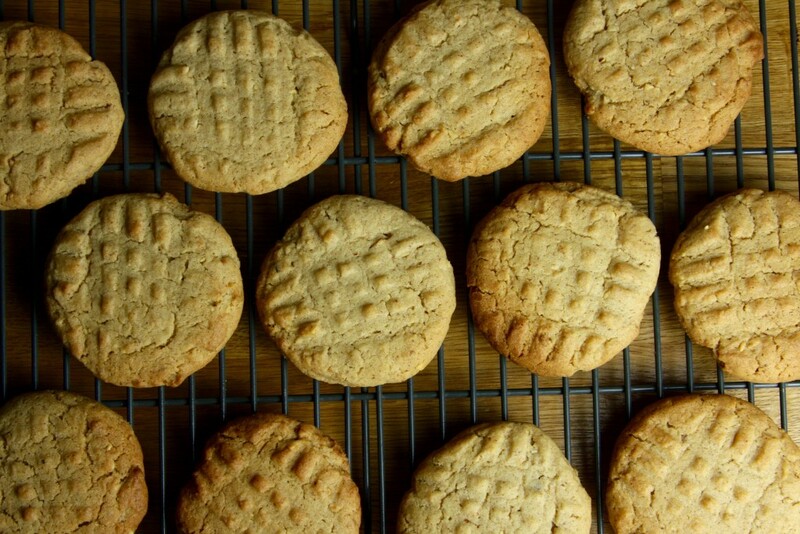 It’s peanut butter cookie day! I have a secret to admit. 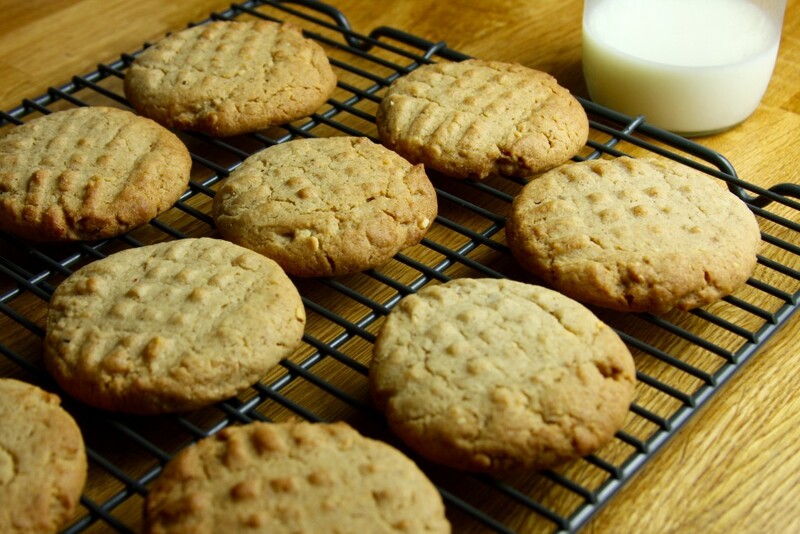 I’ve never made peanut butter cookies before… And this is only the second time I’ve ever even eaten one. EVER. What kind of an American am I?? (Answer: an expat, I know.) Seriously though, I’ve no excuse. For whatever reason — some remaining vestige of a bizarre childhood aversion — I just never went for them. But I’m now grown up, and it’s time to make up for lost time! 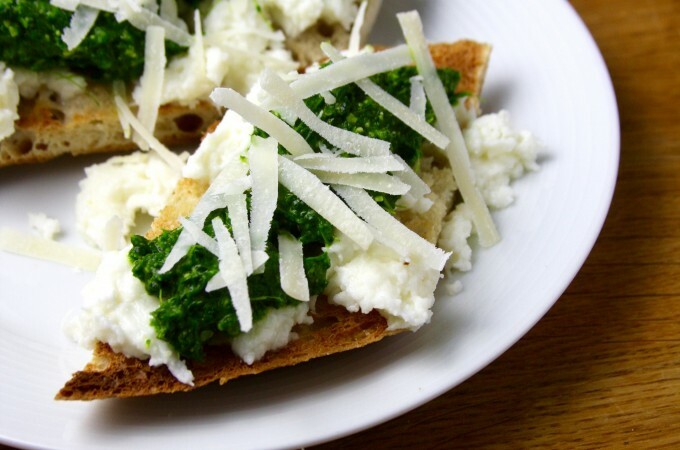 This recipe comes straight from America’s Test Kitchen Family Cookbook. The cookies are sensational — particularly on the day of baking and day after. Moist and a nice cross between chewy and cakey. I might try using some brown sugar next time to see if I can keep the chewiness as what few cookies remained did dry out quickly over the next few days. Pre-heat oven to 350º F / 170º C.
Mix flower, salt, baking soda and baking powder and set aside. In mixer (or bowl with wooden spoon), cream butter with both white and brown sugar. Incorporate dry mix to wet. Lastly, add peanut butter. Be sure not to overmix if you want the crunch! 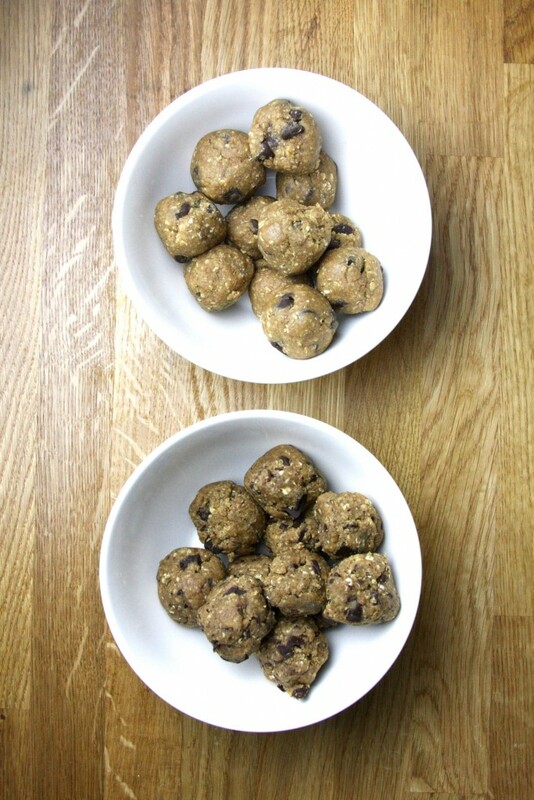 Roll into 2-inch balls and place on the cookie sheets. These cookies will not spread significantly. Using a fork, press down gently on the cookies, making a criss-crossed pattern on each. Bake for 10-12min, and enjoy! I’ve titled this post ‘Rich triple chocolate cookies’, but really it should be ‘the world’s very best, absurdly rich, and utterly moreish triple chocolate cookies’. For years I’ve been searching for a chocolate cookie that was every bit as dense and rich as it looked. But I never really seemed to find something half as satisfying as it looked. But this is it! I found it! A few days later, the hubby and I wanted some chocolate for desert. These hadn’t been sensational that first time around, but the cookies did need to be consumed, and I wasn’t too keen on offering underwhelming cookies to guests. So, out they came from the freezer. I defrosted them all of a few minutes – the time it took to heat the oven. With a sprinkle of sea salt, they went into the oven. When they came out, they were transformed. Glorious. The freezer trip had changed the consistency and the intensity of the cocoa, and somehow trapped the moisture in during the baking process. So, if you’re looking for rich, chocolatey, utterly gooey goodness, look no further than this recipe, and a freezer. Roughly chop pecans. Place in oven for 5-7 min to toast. Set aside. Whisk together cocoa power, flour, salt and baking powder. Set aside. Add eggs, on at a time. Fold in chocolate chunks and pecans. Roll into balls and place on cookie sheet. Place this sheet in freezer, and wait ever-so-patiently 24hr — or at least overnight. 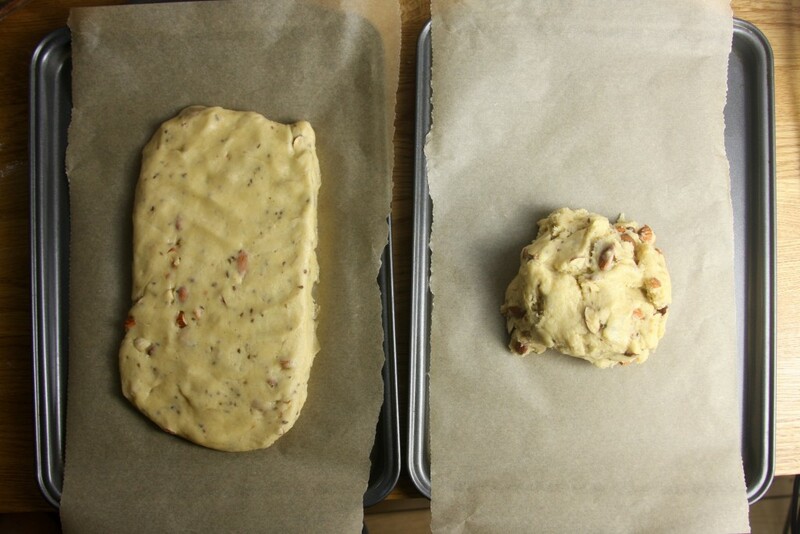 If storing longer, feel free to move the dough into a freezer bag or other type of container. 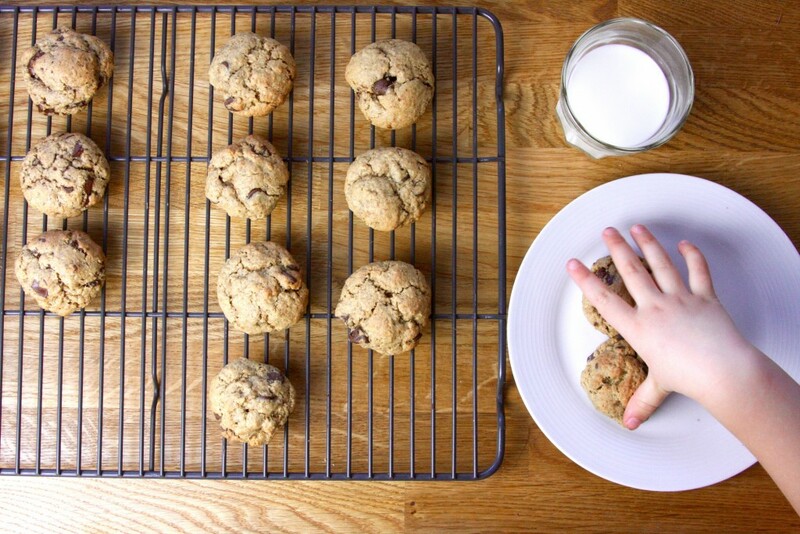 When ready to make cookies, preheat oven to 350ºF / 180ºC. 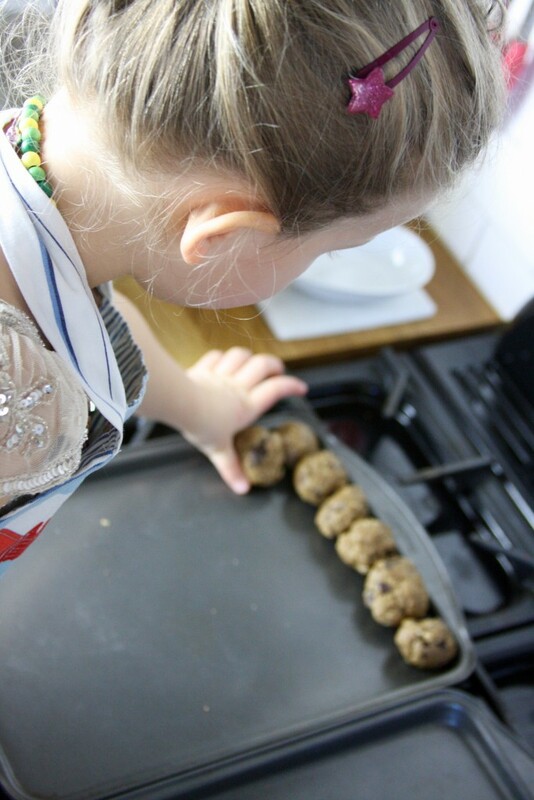 Remove dough balls from freezer, place on cookie sheet, and sprinkle lightly with sea salt. Cook 8-10min, removing after they have just begun to solidify, but are not completely cooked. Let cool on sheet 2 min. Remove promptly and let cool on a cooling rack. After making a very satisfying basic biscotti last week, I really had a yearning for the most traditional of flavours: anise. Or aniseed, as it’s often called. This spice appears to be a far more difficult one to acquire over here in England than back in the States. But source it I did (thank you, Amazon). For those who don’t know, Anise is similar in appearance to Caraway Seeds, but with a liquorice-like taste. I can’t stand liquorice, but still somehow love these little seeds. I made these on a rainy morning while waiting for a friend to visit. My son occupied me more than I had been expecting, so the biscotti were still in the oven when the friend arrived. As such, I wound up not dipping these in chocolate, as I’d intended. And I think they’re actually better for it! They could do with some finely chopped dried apricots. Or candied ginger! But chocolate dip… I’ll leave that for a different batch, and let the anise sing out nice and clear. Toast almonds in oven for 8 min. Let cool. 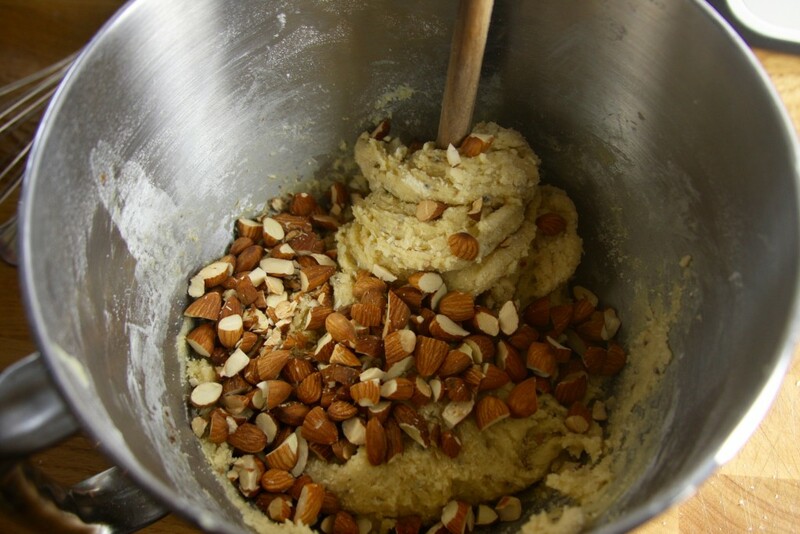 While almonds are toasting, mix flour, baking powder, nutmeg and salt. Set aside. In a small, microwave-proof bowl, place the aniseed and 1 T of the Disaronno. Microwave 15 sec, or until you see some steam. Set aside. Mix sugar and eggs in a stand mixer or bowl with wooden spoon. Add almond extract, aniseed & Disaronno mixture, and the other tablespoon of Disaronno. Chop the almonds — more or less in thirds. Slowly add the dry mix to the wet mix so that it is just incorporated. This is a very thick mix, so you may want to the last bit without the stand mixer, using either the wooden spoon, or your hands. Divide the dough in 2, and place each portion on its own baking sheet. Pat down into slabs that are approximately 2cm deep and no more than 15cmwide. Remove from oven, and place on cooling rack for 5 min. Move slabs one at a time to cutting board. Carefully cut slices at a 45º angle. I found a large chopping knife to be most effective, but bread knives are often recommended. Place cut pieces on their sides back on the baking sheets. Return to oven for 10-15min, or until gently browned. Remove from oven, turn all pieces over, and return to oven for a final 10min. Place all on a cooling rack. They're lovely enjoyed straight from the oven, dipped in a pipping cup of tea or coffee. My dear friend Heather had her birthday this past week. She’s been completely consumed with a move between homes and was going to postpone, if not completely ignore, her birthday this year. But it’s been a difficult past year for her and I thought she needed to celebrate the new beginning. I wanted to make her some sort of great cake, but as she was in the midst of this move, I decided something far more practical was needed. Cookies were out as they just weren’t special enough. Finally, I thought of biscotti. I’d never made it before, although I was a huge fan of my father’s unorthodox creations whilst growing up. So, I read through a variety of recipes and decided to start with the most basic, the most traditional version I could find… and dip it in gorgeous, nutty chocolate to make it at least look decadent. The results are completely satisfactory and decently moreish. Super crunchy until dipped in tea, at which time it instantaneously becomes a warm, soppy mess. It lacks any particular flavour apart from the chocolate, which I suppose could be a good thing if special, flavourful teas were to be paired with it. However, I look forward to refining this. 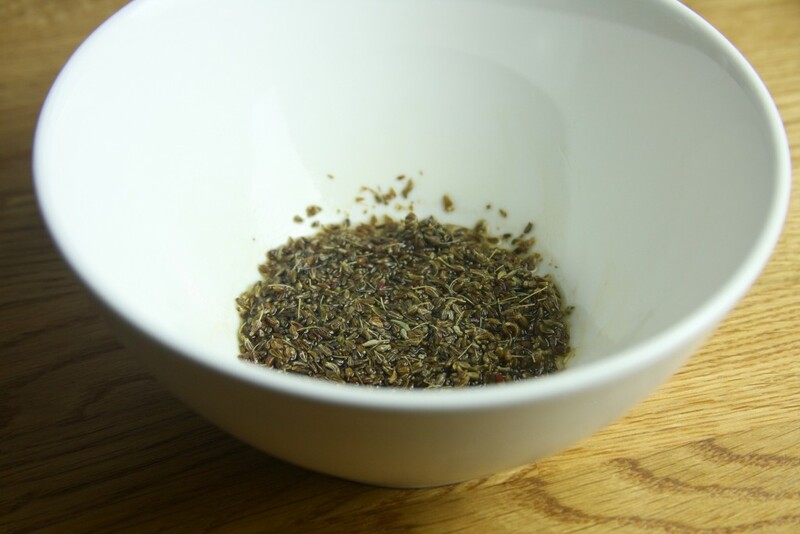 Anise would be the perfect inclusion for even a basic version, though as it (anise) seems to be an unusual item to find in the UK, I may not be able to refine this basic recipe this week. But in terms of expansion, I’d also like to try an apricot & currant version. 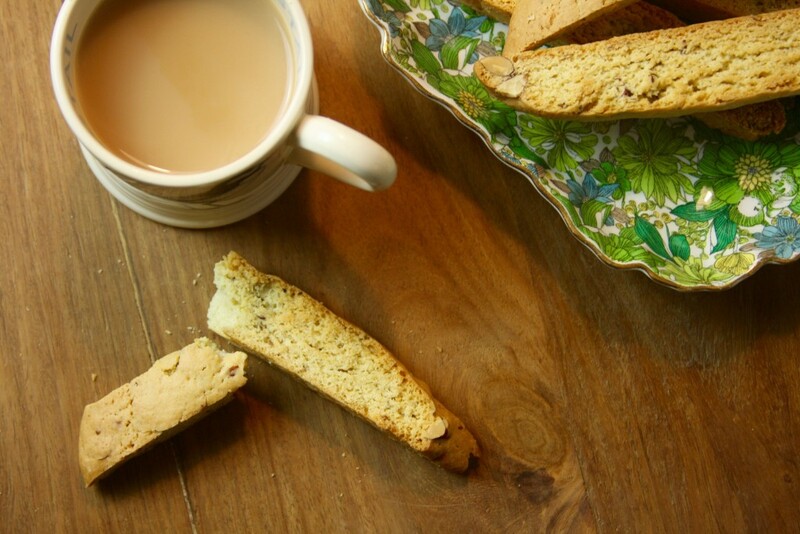 Chocolate doesn’t seem to appeal to me too much, when it comes to biscotti. Astounding, considering how much I love chocolate ordinarily! Regardless, I’m super excited to have biscotti enter my world of awareness. Considering how long it can stay fresh — months, if sealed properly! — I’ll certainly be keeping some in stock forevermore. Of course, my eating through the stock may always be a problem. Preheat oven to 160ºC / 325º F. Bake almonds in any shallow pan (your baking sheet will do) 8-10 min, until golden brown. Put aside to cool. Cream butter and sugar until light and fluffy. Add eggs, vanilla and almond extract. If you've used a stand mixer, then pour this mixture as best you can into a larger bowl. It's going to be very, very sticky. In a separate bowl, combine the flour, baking power, nutmeg and salt. 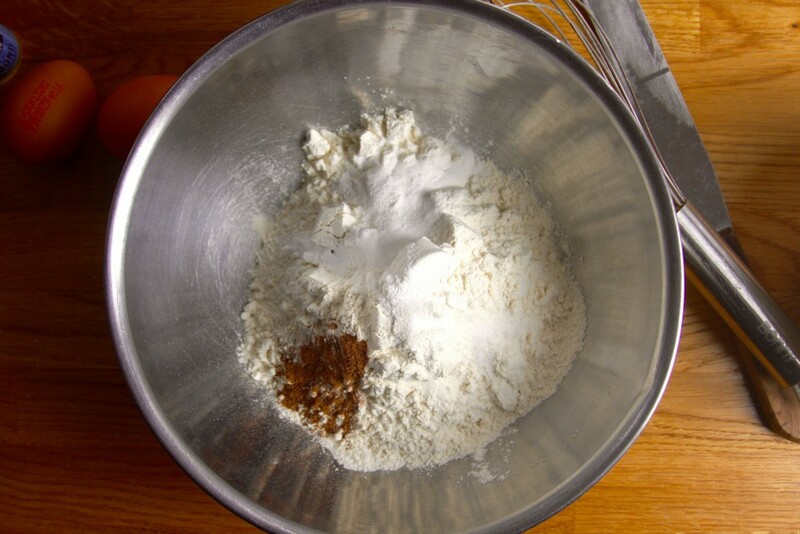 Flour your hands, and add the dry mix slowly to the wet mix. 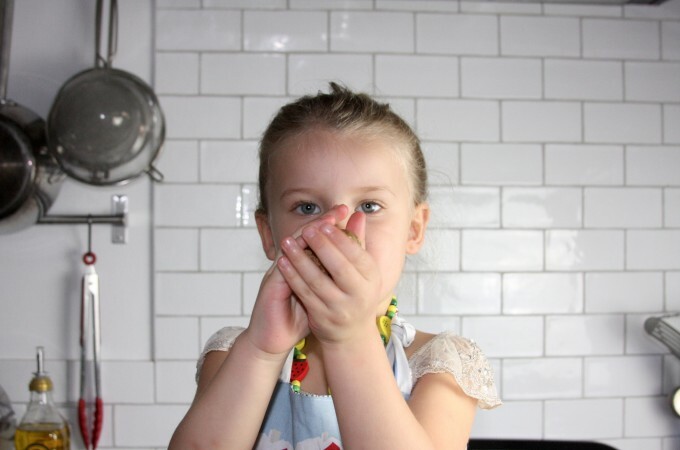 If your hands begin to get too sticky, add a bit of flour. If your hands get really, really sticky, wash them off before continuing. Do not overwork. As soon as the dry mix has been incorporated in the wet, cut the dough in half. Take one dough piece and place it on the readied baking sheet. Press firmly down so that the dough is roughly 2cm deep and about 30cm long. The longer and thinner it is, the less likely the pieces will be to break later. Repeat with the other, ensuring that if they are on the same sheet, that a good couple of inches are in between them. Bake 25 min. Remove trays from oven and place biscotti logs on a cooling tray for about 5min. Keep the baking sheets out — we'll use them again in a moment. 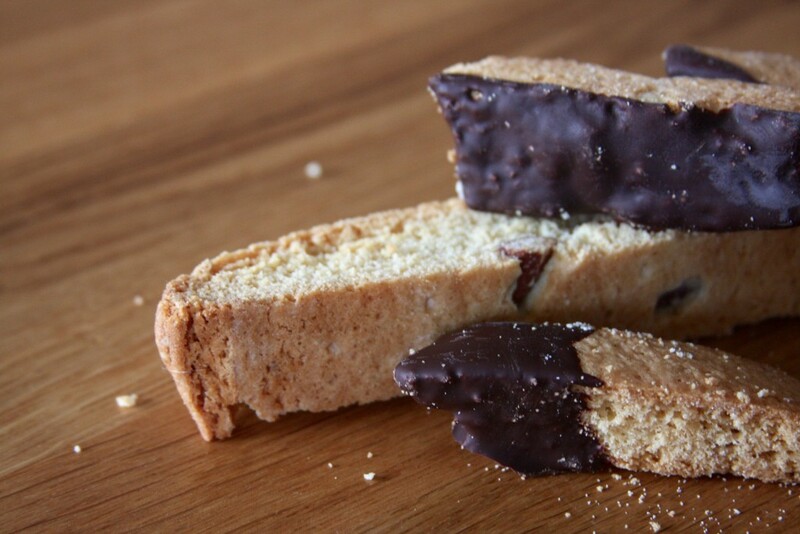 Put biscotti logs on a cutting board and cut diagonally at a 45º angle, using a serrated knife. The angle is optional, but gives that nice, authentic touch. Lay all the slices on their sides on the baking sheets, so that the sides can crisp up. Bake 10 min. Remove from oven, turn everything over to their other sides, and bake a final 10 min. Let cool on rack. If wanting to dip in chocolate and roll in nuts, read on. Melt the chocolate using a double boiler or microwave. Whilst it is doing so, pulverise 2-3 handfuls of nuts. Put the nuts in a shallow bowl. (Make sure the nuts are as pulverised to be as dusty as possible; otherwise the heavier, roughly chopped nuts will fall away from the chocolate dip.). Pour the melted chocolate into a narrow, tall glass and dip the cooled biscotti on in. 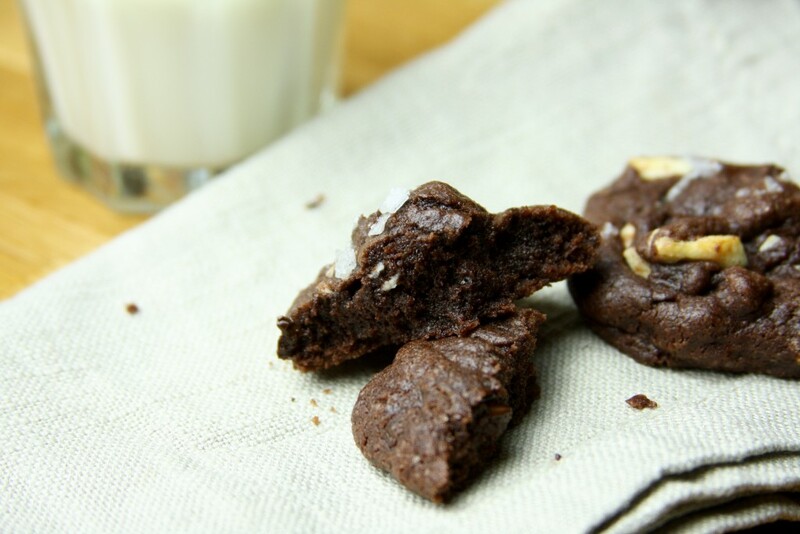 Roll the chocolate portion of the biscotti in the nuts, and place them on the baking sheets and cool in the fridge. Hi! I'm Lyndsay: graphic designer, expat and head chef for a family of 4. I was raised on a farm in Pennsylvania (USA), but now live in Brighton (UK). I love to make food that is wholesome, healthful and absurdly delicious — without being too overly concerned with virtue. 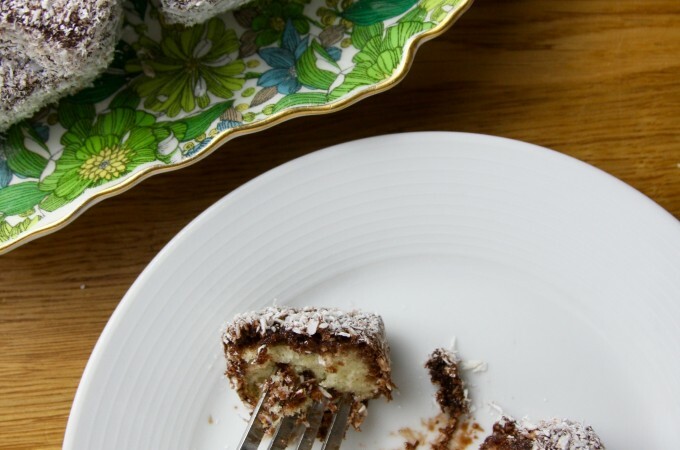 Luscious, light, lovely little Lamingtons!